I was very surprised at the sound quality of this 2cd set. Considering the age of the recording (over 20 years old!!) , and the quality of the sound recording equipment of the late 1970's, you can sit down with your headphones on, close your eyes, crank up the volume and you can almost believe you are there at the concert - especially on this recording because if you listen closely in between tracks you can hear the audience around the person recording the concert chatting and joking (it's a pity it is all in Japanese - I can't understand a word they are saying!!!). The first cd starts off with the classic ELO opening concert track of the time, Fire On High, from the Face The Music album. The band perform this superbly, only the feedback from Jeff Lynne's guitar at the beginning and end of the track enabling you to tell the difference from the recorded version. The audience applaud very politely (no cheering yet!!) and the group are straight into the next number, Night In The City from the album Out Of The Blue. Again this track is performed superbly, with Jeff's and Kelly's vocals harmonising very well together. As the audience again applaud at the end of the track, Jeff thanks the audience both in Japanese and English and introduces the next track - Turn To Stone. 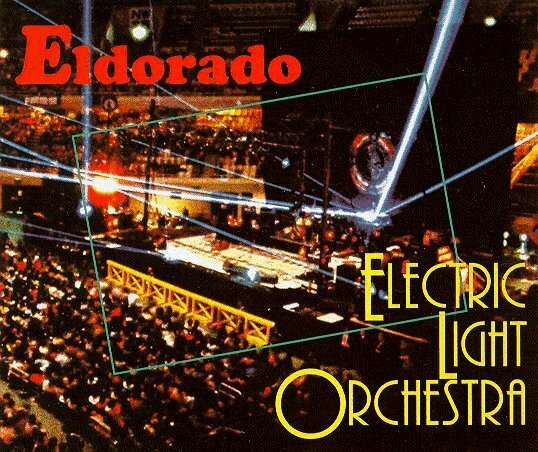 After a perfect rendition of this classic, the band then slow things down slightly with Eldorado Overture and Can't Get It Out Of My Head from (obviously) the Eldorado album. The string section of Mik, Melvyn and Hugh can be heard clearly on these two tracks - not a note out of place! The audience show their appreciation of these tracks with (by Japanese standards) rapturous applause. At this point, Kelly steps up to the microphone and thanks the audience in Japanese and English and introduces the next track by the world's number 1 rock cellist, Hugh McDowell doing his cello solo. The audience applaud Hugh's performance and the band then launch into the next track from A New World Record, Tightrope - performed so well you would think it was the album track itself being played direct from tape!! Next two tracks are the classic Telephone Line and one of my personal favourites, Rockaria - the vocals on each track in perfect harmony. To finish off the first cd, Jeff thanks the audience and introduces Mik Kaminski doing his violin solo which the audience love, judging by the applause at the end of the track. The second cd starts off with Bev coming to the front and thanking the audience for making the band feel so welcome on this their first visit to Japan. Bev then introduces the worldwide hit from Face The Music, Strange Magic. The band play this superbly with the audience finally getting into the spirit by clapping in tune to the track!! Afterwards it's straight into the classic track, Showdown (on the inlay card for the cd this track is called Showdown All Over The World). Next the band perform the worldwide smash hit Sweet Talkin' Woman from the album, Out Of The Blue. The audience again clapping in rhythm throughout the song. The band slow things down again next with Evil Woman - the crowd not needing Kelly to urge them to clap - they started at the tracks' first note!! Another of my personal favourites next, from the album A New World Record, Livin' Thing. Once again the track is superbly played with the audience singing and clapping throughout. A loud cheer from the audience precedes the next track - Do Ya - obviously one of the favourites for the Japanese crowd. Instead of ending the track, Bev keeps the beat going as Kelly urges the audience on to clap and cheer and the band launch into Ma Ma Ma Belle - brilliant!! The show is now reaching it's climax with the audience shouting and clapping and I presume dancing as the final track begins - Roll Over Beethoven. Seven minutes later it's all over with the audience applauding rapturously to an excellent performance. 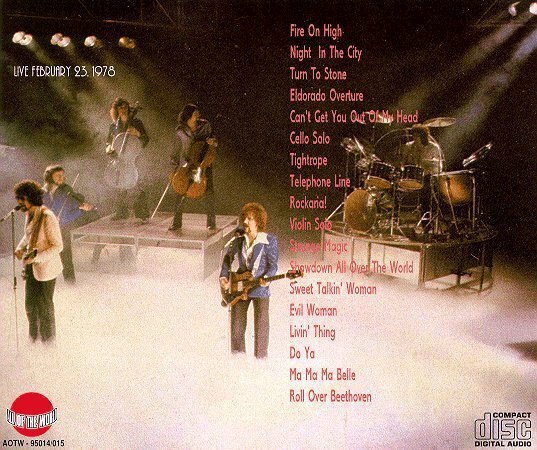 Overall then , I think this 2 cd set is a most welcome addition to any ELO fans' collection - if you can get hold of it! !